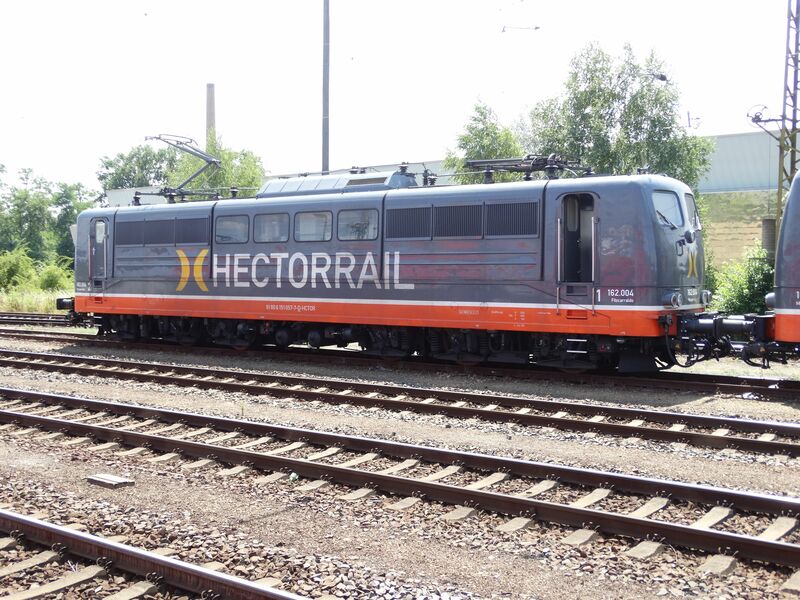 Hector Rail is a private Swedish train operator which has lately grown rapidly. Among other things, Hector Rail bought from DB old, used electric cargo locomotives of the class Br151 and also used large diesel machines of the Siemens tye ME2600 (former Norwegian Di6). 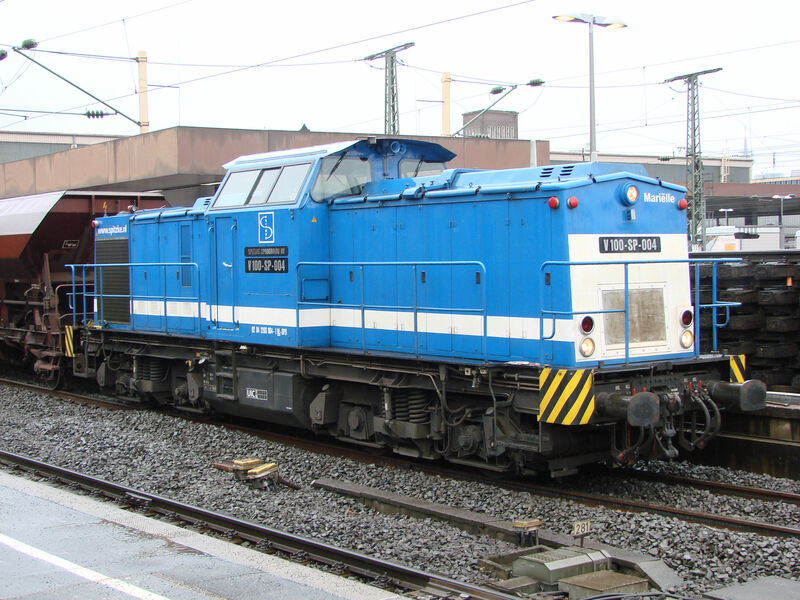 This is an ex-DB Br151 machine, which Hector internally calls class 162. 16 indicates that this is an electric machine with six axles and the last "2" indicates that this is the second six axle electric locomotive type of Hector Rail. Hector runs heavy trains for Shell running between Nossen and Schwedt. Between Nossen and Coswig heavy diesels of the type ME2600 are used and then these Br151 machines take the trains forward to Schwedt. Picture from Coswig 16.7.2018 by Ilkka Siissalo. Three former DB class Br151 cargo locomotives, now in Hector Rails' colours. 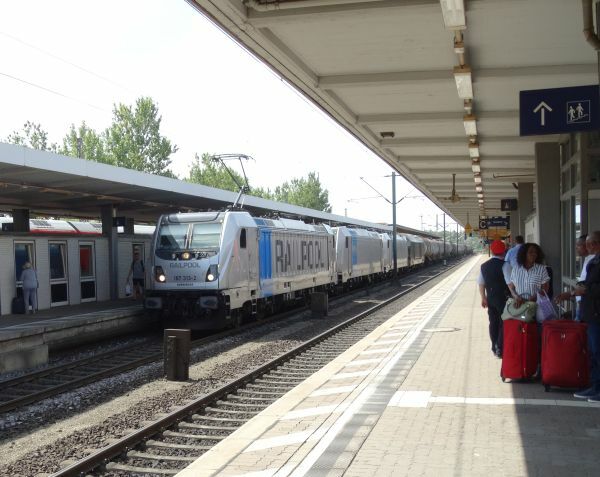 Germany is a country full of small private rail operators which keep leasing, loaning and returning locomotives and wagons often without bothering to change the tapings by the sides of the trains. This is an example of a small operator. 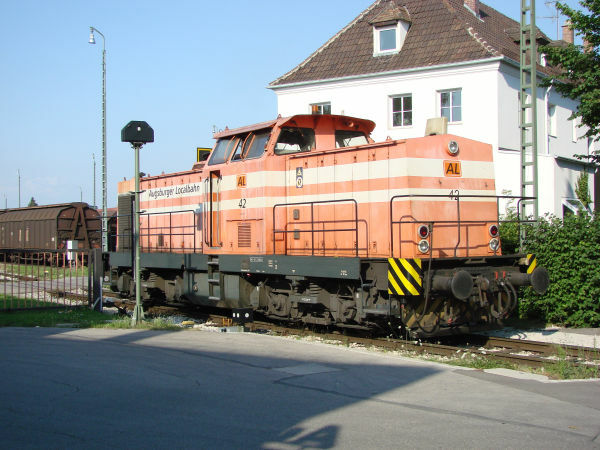 This is a Siemens ER20 "Hercules" heavy diesel engine, owned by the locomotive leasing company Beacon rail and according to the stickers leased by Hessische Güterbahn AG. Picture at Mainz Hauptbahnhof 18.12.2016 by Ilkka Siissalo. An old ex-DDR type V100.1 diesel, the Augsburger Lokalbahn no.42 is crossing a street close to the headquarters of AL. This locomotive was built in the old communist DDr as the Deutsche Reichsbahn 110 884-4 in 1978. It was renamed after the German reunification in 1992 as 201 884-4 and became part of the Deutsche Bahn AG DB 1.1.1994, but it was "z-gestellt", put out of use already in October 1994. In the summer of 1995 DB took it off its books, but it wasn't immediately scrapped, but renovated by Regental Fahrzeugwerkstätten GmbH, Reichenbach (Vogtland) and finally sold to Augsburger Lokalbahn AG in April 1998 as their no.42. 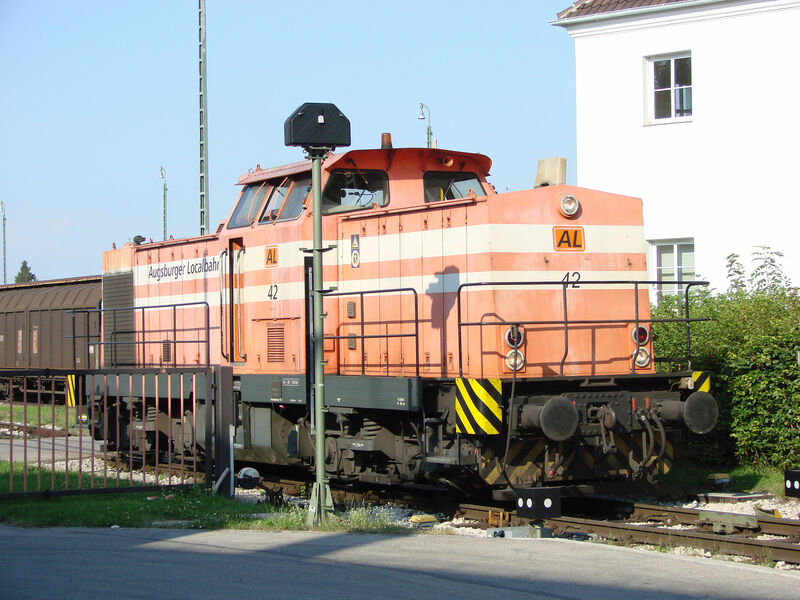 AL has five of these ex-DDR V100 locomotives in use. Picture close to the headquaters of AL in Augsburg 19.7.2007 by Ilkka Siissalo. Another picture of the same AL no.42 ex-DDR V100, ex-DB 201 884. Picture in Augsburg 19.7.2007 by Ilkka Siissalo. MRCE Dispolok, former Siemens Dispolok, is a locomotive leasing company leasing a large number of machines to both big and small rail operators. Often - like here - especially when the lease agreement period is short, the locomotives do not at all receive any markings identifying the rail operator in question. This is a Siemens ES64 U2, also known as the German Br 182 or in Austria the first generation Taurus locomotive. In Austria these same machines are called Br1016. Picture from Augsburg Hauptbahnhof 10.10.2015 by Ilkka Siissalo. A tank train of chemical wagons being pulled by a third generation Bombardier TRAXX locomotive of class Br187 has also three other locomotives in tow. The second and third locomotive with their pantographs down are second generation TRAXX machines, Br 185 or Br 186, and judging by the grey livery with a blue band, they also belong to Railpool. 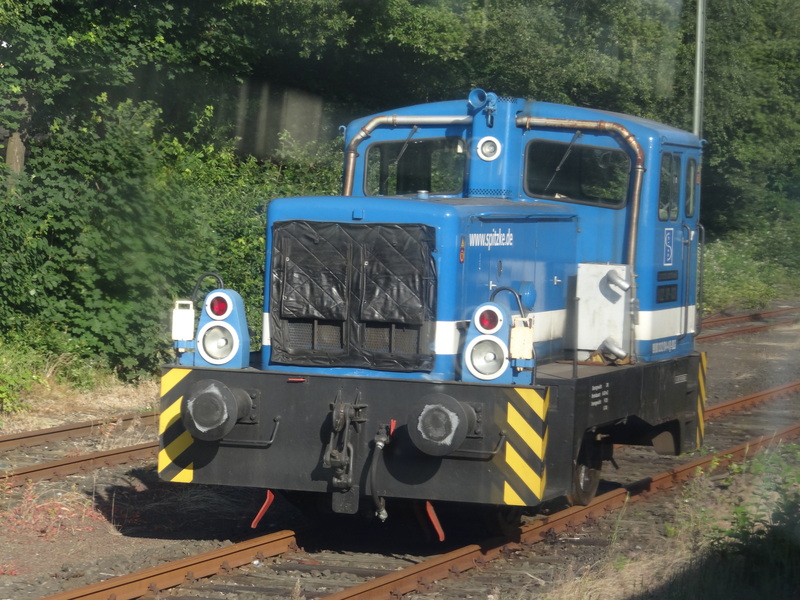 The fourth black locomotive is a Siemens ER20 Hercules diesel and the black painting is typical of the locomotive leasing company MRCE Dispolok. It's difficult to guess which railway operator these machines are working for. Railpool as well as MRCE Dispolok are both locomotive leasing companies and their machines change from operator to operator quite often. What we do know for sure is that this TRAXX 3 machine, Br187 313, is one of the newest locomotives of Railpool. It has also one of the so called "last mile" auxiliary diesel engines, so it can operate even without overhead wires. It is a multiple electric system machine accepted for use in DE-AT-HU-RO and it was received by Railpool in 2017. 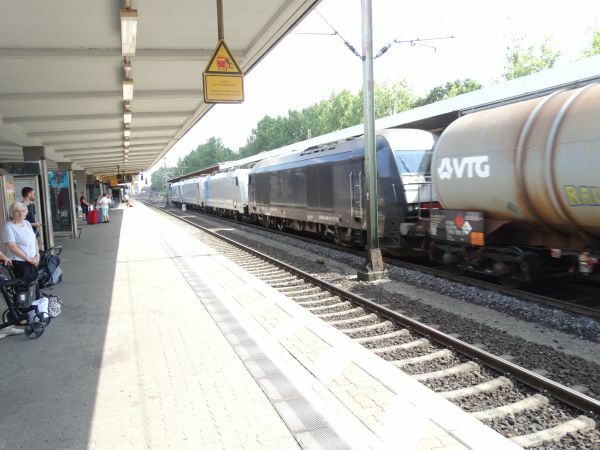 It is further known that at least in 3/2017 Railpool rented it to the Hamburg based operator HSL, Hamburg Schienen Logistik and that HSL used it then for hauling similar chemical wagons as here. This may well be an HSL train. Picture from Braunschweig main station 17.7.2018 by Ilkka Siissalo. 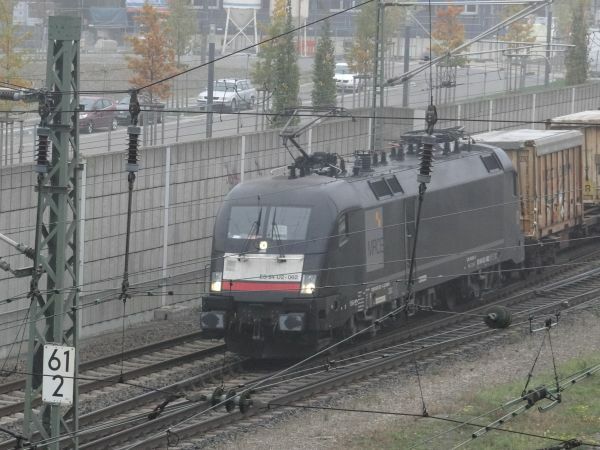 Same train as shown above as it was rolling past the Braunschweig main station. 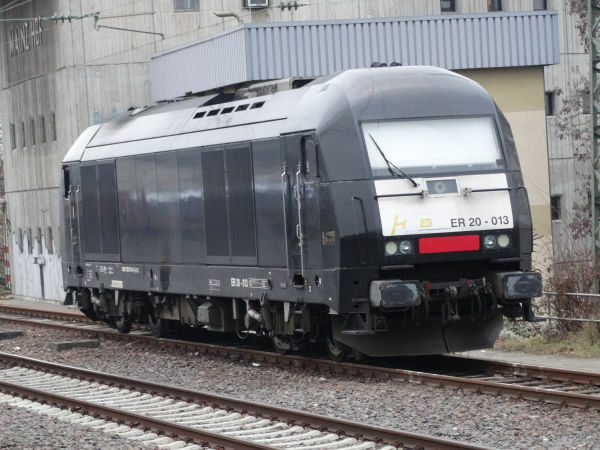 From this side it is possible to read some of the texts of the black Siemens ER20 diesel locomotive and now it is obvious that also it is registered to Railpool, although it carries the black livery of Railpool's competitor MRCE Dispolok. 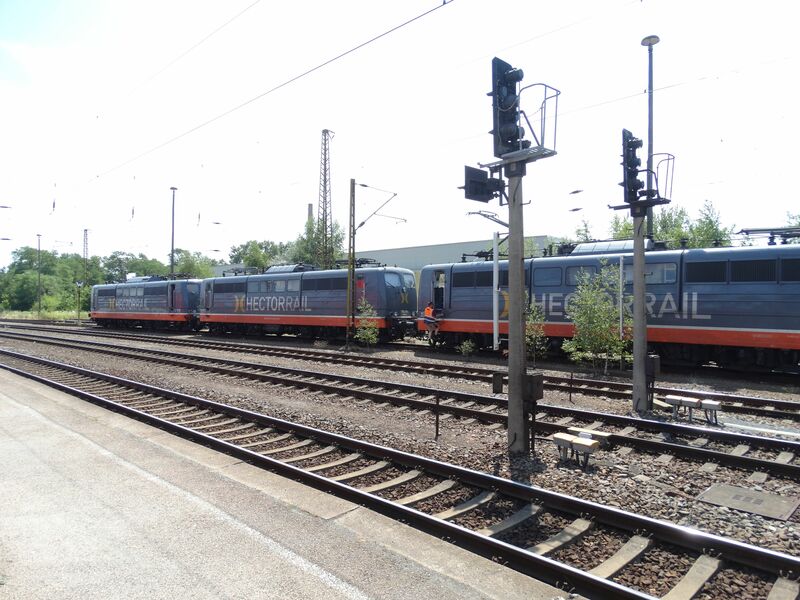 Renovated ex-DDR diesel machines have been popular especially among small private rail companies involved in rail maintenance works. 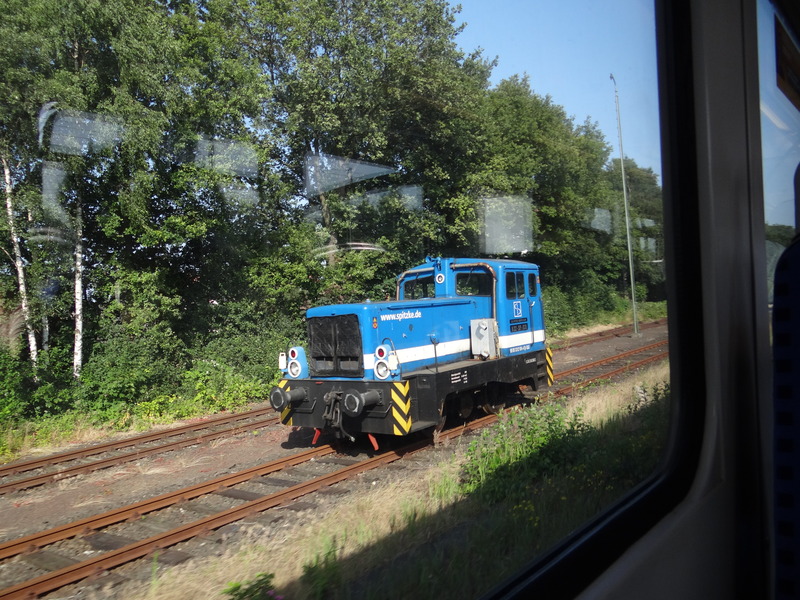 This one is an ex-DDR V100 machine of the DB class 203 owned by the Dutch Spitzke Spoorbouw BV. Picture by the Düsseldorf Hauptbahnhof 26.2.2010 by Ilkka Siissalo. A quick shot from the window of a passing train. This is an old ex-DDR locomotive of the class V22 owned by Spitzke. Nowadays an absolute rarity. Picture close to Eidelstedt station in Hamburg 9.7.2013 by Ilkka Siissalo. Another shot of the same V22, again through a window of a moving train. Picture close to Eidelstedt station in Hamburg, this time on 8.7.2013, by Ilkka Siissalo. 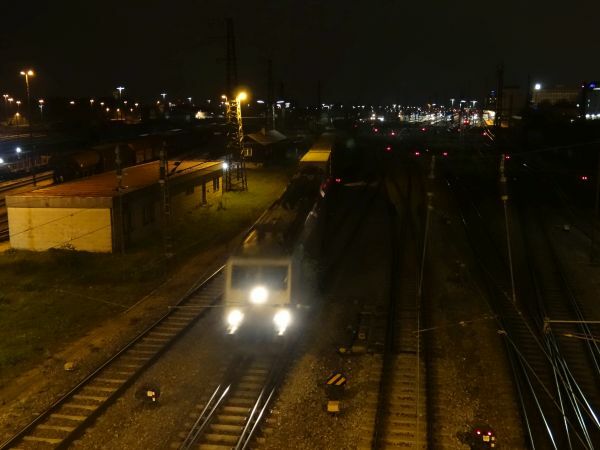 Picture from Augsburg Hauptbahnhof at late night of 10.10.2015 by Ilkka Siissalo.